At this point, Jenn had her baby shower and relatives had sent gifts and cards congratulating us on the little man that was about to enter our house so our house already looked like Babies ‘R Us had setup shop in every room. However, there were some items we need to get checked off the registry, so we figured the weekend before we hit 36 weeks (that next Tuesday) would be a great time to get that done. We headed to the store with gift cards in hand ready to tackle the list. All we were really missing were some little must have items (bottles, pumping accessories, etc. ), so the process was pretty painless. After two stores, we were done and I got Jenn home to rest. That following Monday, we had another followup with the OB to see how things were going with the pregnancy and to start getting ready for when Daniel was wanting to make his appearance. Ironically, I had a panic situation with work and I was not able to make it to this appointment…it was also the only appointment I didn’t make through the process as I have the ability to work from home (that was a blessing through all of this for sure!). So…I had to run to North Carolina. Half way up there, I get a call from Jenn. Her blood pressure was through the roof and they were going to start blood and urine tests to see what was going on. For now, they pulled her from work and told her to go straight home and lay down. After a 24 hour urine test..we should know what is going on. Needless to say, this was a surprise. Up until this point, everything had been going smoothly (or as smoothly as a pregnancy can) and now I have a worried wife, but a healthy baby. After the 24 hour urine test, we headed back to the doctor’s office on Thursday. Guess what? You have Preeclampsia. My first thought…what the hell is Preeclampsia?! Apparently, is a medical condition in which hypertension arises in (pregnancy-induced hypertension) in association with significant amounts of protein in the urine (thanks wikipedia). While it isn’t harmful to my wife or the baby at that point in time, it does start to get dangerous as time goes on…and quickly. We headed into the doctor’s office Friday ready to see how our little guy was doing. 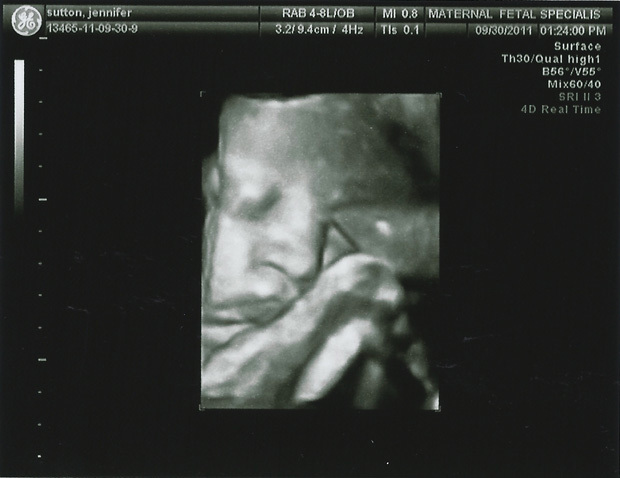 In the ultrasound, everything looked great. Lungs were there…heart was beating away…he even estimated out to 6 lbs 11 oz which is really good for being over 3 weeks early. The doctors decided he was ready to go. Our bigger surprise? When she came back into the room, she had already scheduled for us to go in Monday night to start the process of inducing my wife. Congratulations…you are having a baby next Tuesday. The whole experience kind of set us back for a second. That soon? Yep…according to the doctors, he will be at exactly 37 weeks at that point, so they do not want to wait any later. After you sign these papers, you will be ready to go. Enjoy your weekend! As we were leaving the doctors office a little bit stunned, the first thing that came to mind was…”babe, I guess it is a good thing we got all of that shopping done already!” We had a short laugh and then reality started setting in. We are going to be parents early next week come hell or high water. During the entire pregnancy process, you are always looking towards that period of time where the unknown could strike at any moment. You need to have your bags packed, affairs in order and then wait. The baby doesn’t come on your schedule, but whenever he feels like it. You are on pins and needles wondering, “will this be the day?”. Not for us…we just made the appointment! It wasn’t exactly how we envisioned this whole process going down, but I guess that doesn’t really matter because we hare doing the right, healthy thing for her and Daniel. The end result will be the same. Holding our son for the first time. So here it comes…the big day.